It’s 2 p.m. Tuesday. The trade show starts Friday morning and, as usual, your client has just delivered the artwork to be used on the project. But you’re not worried – you will place your wholesale custom order with Georgia Printco, LLC because you know it will be printed and ready on time. Wholesale grand format printing at its best! WE WORK HARD AND PLAY HARD. THESE ARE OUR TOYS. 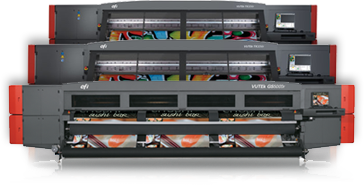 You don’t become the wholesale industry leader in big format projects or huge banner runs without the right equipment. We have the right equipment and we add more machines often. Nobody does roll to roll materials like Georgia Printco, LLC. With our state of the art roll to roll printers, we can deliver 3,600 ft²/hr of beautiful, durable vinyl banners that are a custom fit for your application. And, because our roll to roll printers are backed up, we never fail to deliver your project on-time. Need wholesale superwide direct or paper transfer fabric printing with resolutions just right for short and medium distance viewing? We lead the wholesale grand format industry with rich, deep blacks and bright, long-lasting colors for fabric applications. And yes, our textile printers have backups as well. We’re simply not going to miss your deadline! Georgia Printco, LLC’s hybrid printers are capable of printing flexible and rigid materials. With white ink capabilities, anything is possible. You’ve never seen POP, indoor, and outdoor signage like this. Backup printers here too, ensuring on-time delivery every time.